Author: James Donovan. Read by the author. Publisher: AudioGo, 2012. Original, Little, Brown & Co., 2012. 500 pages. Texas, 1836. A mixed group of settlers from the US and Mexico declare independence from Mexico, and in the name of liberty create the new nation of Texas. Santa Anna, dictator of Mexico and part of the reason they want out, reacts badly. When a group of about 150 Texans, led by William Barrett Travis and including Jim Bowie and David Crockett, take a stand at the Alamo, Santa Anna ultimately sends an army of two to three thousand against them. The outcome, as we all know, was bad for the defenders, but ultimately equally bad for Santa Anna. 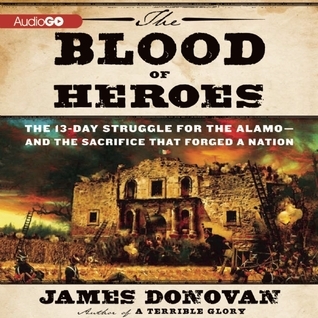 James Donovan explains the events leading up to and away from the fatal days at the Alamo, tracking the major players and events and discussing their significance. [Note: the publisher's blurbs refer to the defenders as "Americans." While many were, in fact, Americans come from the States to help in the fight, the locals were very serious about themselves as Texans (or "Texians" as I believe the author calls them), citizens of a new republic). Since most of what I knew about the actual events at the Alamo could be summed up in a single sentence (think something like "Remember the Alamo! "), I was bound to learn a fair bit from this book, and I did. Being vaguely aware that Texas had been, for a short time, an independent republic, I knew that this story would have something to do with that. In the course of listening to the book, I learned not only the politics behind the struggle, but also the people involved. Donovan does a good job of making clear what happened and why, as well as (especially in an excellent epilogue) making clear the detective work required, after so long and writing of an event with no direct surviving witnesses, to figure out what happened and what is just the myth that has grown up around the event. The author takes, in my opinion, a very even-handed view of the events. While he is generally sympathetic to the Texans' side of things, he does explore motives and characters on the Mexican side, and is open about the brutality displayed by both sides, though it appears to have been more reactive among the Texans and deliberate on Santa Anna's part. I admit I wasn't as taken with Mr. Donovan's reading of the work as with his writing of it. He avoids the overly-dramatic rendering that sometimes irritates me with non-fiction audio books--and I found that adding a little drama into the reading might not be a bad thing. The reading is very clear and easy to follow (though as often with this sort of work, there are enough players that I had trouble keeping track, especially as I am a more visual learner, and remember names best if I see them written). It is, however, a bit flat, making it too easy for my attention to wander. As seems to be becoming too common, I'm more inclined to recommend reading the paper book than listening to the audio. In addition to my trouble keeping track of the many players, there are maps and pictures not available to the listener. The story itself, however, is worth listening to, at least for those of us who like knowing bits of history. Certainly given that the cry of "Remember the Alamo!" echoes through American literature, at least, it's worth knowing the origins and significance of the event. Full Disclosure: I checked The Blood of Heroes out of my library, and received nothing from the writer or publisher in exchange for my honest review. The opinions expressed are my own and those of no one else. I am disclosing this in accordance with the Federal Trade Commission's 16 CFR, Part 255: "Guides Concerning the Use of Endorsements and Testimonials in Advertising." I remember the story from the wonderful film, with just about every actor of note at the time it was filmed. I know I did read some more stuff around the politics - probably in James Michener's Texas. This sounds like an interesting book, though, and I didn't realise there was so much to be done to research it.